plant based detroit. : INSTANT POT KABOCHA SQUASH SOUP. 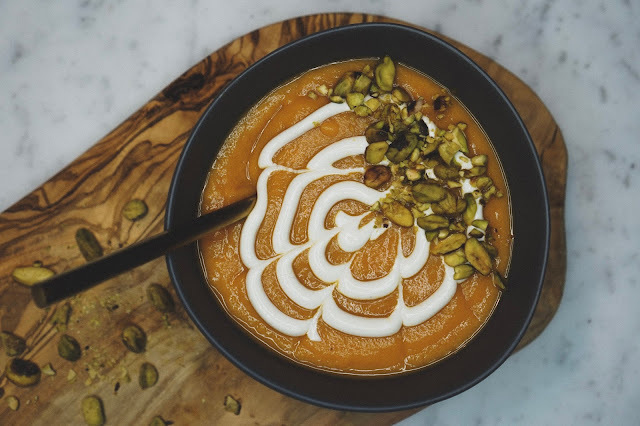 INSTANT POT KABOCHA SQUASH SOUP. Here is the midwest, it is undoubtedly peak soup weather - you may have caught on to this based on my last few recipes. Not only is soup super warming and comforting this time of year, I love making a big batch to enjoy all week. Doesn't soup just seem to get better over time?! This recipe obviously goes right along with that thought process, and bonus - it can be on the table for dinner in under an hour. Really. God bless the inventor of the Instant Pot. If you don't have one, it's something I would really recommend investing in. It's so convenient for not only batch cooking for the week (steam potatoes or make big batches of beans and grains in minutes) but it also makes healthy cooking so much easier for those of us who have over-scheduled, hyper-busy lives. Blending this soup makes it feel ultra luxurious and indulgent, when in actuality, it's super low in calories and fat (not that this is a big concern for a plant based diet). It's actually SOS (salt, oil and sugar) free! I enjoy topping it with something creamy like vegan sour cream (shown here) or coconut cream, and something with a crunch like toasted pistachios (shown here) or pepitas. Place all ingredients in the IP (whole is fine) and cook on manual high pressure for 25 minutes. Natural release for 10 minutes. Rough chop all fresh produce. Place all ingredients in your crockpot and cook on low overnight, or on high for 6 hours. Once cooked, blend smooth using an immersion blender (I use this one). If you don't have an immersion blender, allow to cool - this is important!!! - and blend in batches using your blender or food processor. CURRIED CAULIFLOWER AND BUTTERNUT SQUASH. VEGAN-FRIENDLY SNOW BOOTS FROM COUGAR SHOES. THE FLUFFIEST, 5 MINUTE VEGAN PANCAKES.